First off, I adore this color. It’s the perfect vibrant green color without being too light or too dark. I’ve also got A England’s “Dragon”, which is a bit more yellow-toned than the blue-leaning “Evergreen”. The formula on this polish is fantastic. It is the perfect consistency and incredibly easy to use. I used two coats here, and that was more than enough. It dries nice and fast, which is great for me, since it means less time to mess things up. Plus, the holo hides any issues or user error (as in “oops…hrm, I’ll just add another coat”). Feast your eyes on that holo. It shows up just as well in the tepid winter sunlight as it does under artificial light inside. Did I mention that this is one of my new favorite polishes? The wear time was average- I wore it for 5 days and there was minimal tip wear but no chips. It didn’t stain my nails, but it did stain my cuticles just a tiny bit when I removed it. 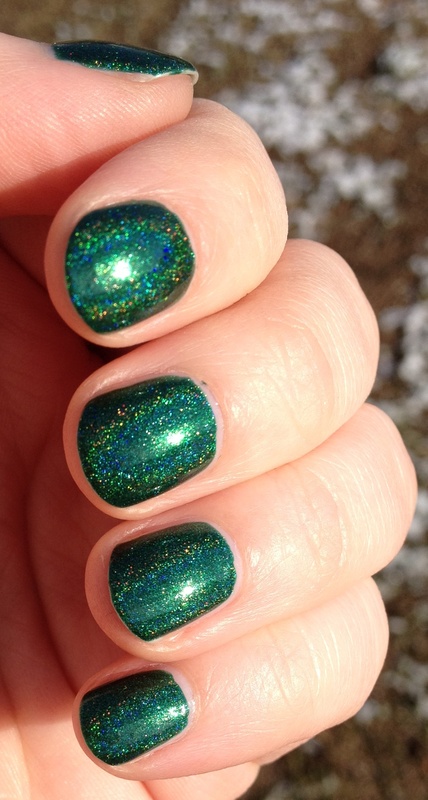 You can get “Evergreen” at I Love Nail Polish’s website (go look around, you’ll want everything). Shipping is fairly fast and the shopping experience is high quality. If you like greens, or holos, I say definitely go for it!